-One or two quart glass mason jars with lids and caps. 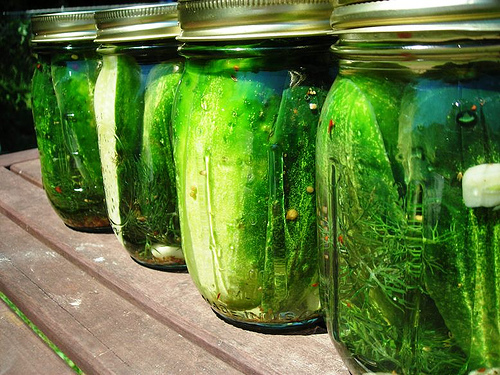 -Fresh pickling cucumbers, preferably small enough to be able to pack a fair number into the jars. 1. Soak the pickling cucumbers in cold water, drain dry. Do not use hot soap and water as that will kill the necessary bacteria for fermentation. 2. Pack the cucumbers, beans, and tomatoes into the jars. -1-2 tsp pickling spices per quart (optional 1/2-1tsp of crushed red pepper). -2 Pressed garlic cloves per quart (more or less to taste). -Lots of fresh dill on top. 4. Add salt water to brim of jars. Make the salt water brine by adding 1 cup of coarse salt per gallon of water. Tip: To dissolve the salt easily, add part of the water to all of the salt, stir, pour off the clear solution, add more fresh water, and repeat until all of the water is used. 5. Place lids and caps on jars, keeping the amount of air to a minimum. Screw lids closed, but not too tightly as some gas will be produced in the process of fermentation. 6. Store the jars in a cool place. Place them on a tray in the event of liquid overflow. Every 2-3 days, add more salt water as needed to replace lost fluids. 7. Fermentation should be complete after 10 days. After this time, carefully top off each jar to the brim with salt water, making sure that the lip of the jar and lid are free of spices or dill which could create leaks. Tighten the cap securely. Store the jars in a cool, cold place. The flavor will be mature in four weeks. Voila! Your little delicacies will keep for up to a year as long as caps create a strong seal. Special thanks to Aaron Novick for his recipe, and to Nikki Jacobi for passing it along! It’s summer. The kids are home from school, the weather is warm, and the tourists are back. Instead of staying cooped up in front of the computer or television, get outside with a number of events that explore the beauty of San Luis Obispo’s wild landscapes. You will learn a little about where you live while enjoying the beauty and diversity of the Central Coast! Wilderness Explorers- Running from July 30-Aug 3, join Outside Now in Santa Rosa Park to discover some of the county’s most fascinating ecosystems! Participants in the Wilderness Explorers will learn basics in local ecology, ethnobotany, animal tracking, and native uses of endemic flora and fauna. The program is designed for children aged 8-12 years. Transportation is provided from a central meeting location in SLO. For more details on this informative and engaging camp, visit their website for fees, scheduling, and additional activities. Anacapa Adventure- Grab your hiking gear and make your way to the City Hall of Pismo beach on August 11 at 7am. The trip will explore the beautiful Channel Island located 12 miles off the harbor in Oxnard. Adults 18 and over will spend the day trekking across the East islet and observing amazing examples of marine and avian life. The cost is $90 per person and registration ends July 27. To reserve your space, call (805) 773-7063. Dune Day- Enjoy the Guadalupe-Nipomo Dunes National Wildlife Refuge free of charge on September 29. Wander through one of the largest coastal dune habitats remaining in California. Bring your camera to capture glimpses of endangered species such as the Snowy Plover, a variety of marine mammals, and sea birds. Camp Ocean Pines- Give your kids an experience they will remember for the rest of their lives at Camp Ocean Pines in Cambria! With sessions through July 27, the accredited nature camp offers overnight stays, field trips, and a host of fun games and lessons on their beautiful campus by the sea. Teens have the chance to take field trips with knowledgeable local guides that stop at sites across the state. Visit their website for registration and info. Trail Trekkers- Sinsheimer Park hosts the Trail Trekkers Jr. Ranger Activity Camp from August 13-17. Kids spend the week learning about topics that span from energy conservation to back country camping techniques. The course is $100 per participant and can be reserved through the City of San Luis Obispo website. Surf Camps- Sign up for Surf Camps held at the Sandbar Surf Company in Pismo Beach! Instructors teach both beginners and experienced riders ages six and over. They make sure that each student is safe and having a wonderful time spending a day out on the waves. Wetsuits and boards are provided for sessions running through the end of August. Register through the San Luis Obispo Parks and Recreation activity website! It is summer, and lavender is in the air! Follow your nose to the Fourth Annual Central Coast Lavender Festival, held on July 14 at the Downtown Paso Robles City Park from 10am to 5pm. This free event highlights an emerging California product and its producers from across the county. Taste examples of lavender cuisine, smell quality essential oils, sample delicious dipping sauces, try botanically inspired ice cream, and learn about sustainable farming practices. Attend seminars distilling the fragrant flower, and take part in the talks, lectures and demonstrations at the City Park Gazebo. In addition to the floral fanfare, the festival will feature a juried arts show, children’s activities, and a bouquet of food and crafts vendors. Lavender, from the genus Lavandula and a part of the mint family, is commonly used as an antidepressant, anti-inflammatory, antiseptic, sedative, and stomach settler. Growing between 2-3 feet tall, this perennial herb sports purple-blue flower that cluster in spikes at the tops of stems, emitting a pleasant and relaxing scent. The plant originates from the Old World, native to land spanning from the Canary Islands across Southern Europe, the Mediterranean, Arabia, India, northern and eastern Africa, and Cape Verde. English, Dutch, and French lavender are most often used for the production of essential oils and as ornamental vegetation. The flowers yield nectar that when pollinated by bees, makes for a highly sought after variety of honey. The blooms can also be candied, steeped in tea, pressed into extracts, and used as confection decorations. Take your family to Paso Robles for a little floral fun! To proponents of permaculture, farming is not just about the production of food, but a means through which humans care for their communities, restore the land, and display the most enlightened of agricultural techniques. Modeled after natural systems, permaculture aims to work in harmony with the earth, provide nourishment for people, and place limits on growth and consumption. The discipline draws upon elements of organic farming, population dynamics, bioethics, and ecology. Through these practices, permaculture allows for more self-reliance and maximum efficiency. Crucial to the understanding of permaculture systems is the comprehension of the relationships between each design element, from landscape topography to species interaction. Practitioners become adept in the 12 principles that guide each new undertaking and at utilizing the guidelines to create dynamic farms. Where better to get back in touch with your literal and metaphorical roots than on the Central Coast’s very own Four Elements Organics Farm? Join the teaching team led by Larry Santoyo this September 2nd-15th for the Earthflow Permaculture Design Certificate Course. Tuition covers in-depth talks and hands-on training in the patterns and principles of EcoVillage Design and Economic Development. The program is located at the beautiful Four Elements Organics Farm, nestled in the coastal mountain range of San Luis Obispo. Four Elements showcases examples of permaculture and biodynamics, including such features as cob ovens, composting toilets, biodiesel production station, straw-bale greenhouse, rare herb garden, and orchards. For more information or to reserve your place, contact farm manager Matt Finkelstein at matt@fourelementsorganics.com! It used to be that the biggest danger to your children from their toys was not being able to find their favorite plaything before bedtime or a long road trip. Now, parents lose sleep over where action figures and stuffed animals are produced, whether the materials are safe, and what will happen to them once they reach the end of their life span. Toys are supposed to be enjoyable, not objects of worry and anxiety! Bamboo is an eco-friendly, non-toxic, and sustainable choice for fun. Luckily, there are innovative and imaginative designers out there with our children’s entertainment and well being in mind. – Israeli designers and Chinese manufacturers have teamed up to create safe bamboo toys for children. The Hape Company and students at the Shenkar College of Engineering and Design in Tel Aviv collaborated with traditional craftsmen to build rolling cars, garden sets, games, puzzles, and dolls. – For the young artists out there, Rocking Frog makes a bamboo version of the classic spiral drawing toy. Just the right size to fit into a backpack with a couple of crayons and a few sheets of recycled paper, the smooth bamboo tablet and wheel are hand-crafted in the United States. The North Carolina builder also offers gorgeous rocking animals composed of bamboo plywood, and finished with with safe stains and seals. – Bambu Batu is proud to carry (and shake) Dandelion Toys® Bamboo Zoo plush rattles, made from bamboo viscose and filled with corn stuffing. Machine washable, they are free of harmful toxins, extremely soft, and made in the US. Perfect for teething, coordination, and a snuggle, they are a great addition to your baby’s crib or stroller. – When your baby is teething, it is of the utmost importance that they are chewing on something that is safe and free from harsh dyes and chemicals. Opt for an organic knit blankie with teething ring from Baby Green Sprout for your little one to gnaw upon. The ring is filled with sterilized water and can be cooled in the refrigerator to bring relief to sore gums. Feel confident about your purchases! Look for bamboo, reclaimed materials, safe dyes and sealants, and non-toxic materials!